The best thing about doing what I do is the appreciation people have when they like something of mine. Sometimes it is in words and sometimes it is in photos. This morning I received an email from a customer who purchased an ABCme poster earlier this year. Rachel lives in the US and sent me some photos of her little boy's nursery where the poster hangs proudly on her wall. Isn't it the most amazing room? I've been working on some more commissions of late. These three are finished and I have another still to do. I really enjoy making these. And last but not least I will be joining a group of local ladies in Brisbane for a Christmas Twilight market this coming Friday the 27th from 6pm. If you are in Brisbane and would like to come along, please email me and I can tell you the details. 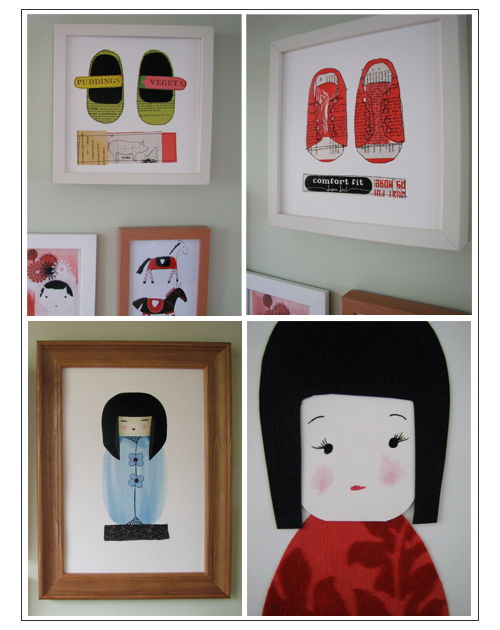 I will have a few new prints and originals there, including new Kokeshi dolls which are also in my etsy shop. As promised I am updating my shop and will have new works available from Monday night Jan 21st. Brisbane, Australian Timezone. Meanwhile you can see them over on my flickr page. I also have a new free wallpaper called "Suki says". Look at the top of the screen to your right.